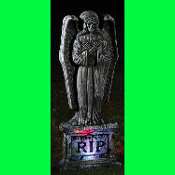 24-inch light-up tombstone has angel sculpture. Looks like the real thing! Lightweight polystyrene headstone has a realistic weathered-stone look. Perfect for any haunted house, graveyard crypt or tomb! Lightweight prop should be properly secured in windy conditions to prevent damage or loss. *Recommended for indoor or covered porch use only. Protect from moisture if used outside. Requires 3 LR44 batteries, NOT included.